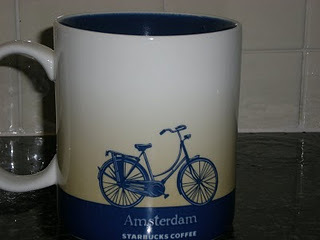 I brought home an Amsterdam city mug from Starbucks the other day and Mr. Man says “I thought you weren’t collecting those.” As I placed that mug in the cabinet next to the others I responded, “I’m not.” Yes, there are multiple mugs, but I’m not just picking up mugs from every Starbucks in every city I step foot in. Shoes, yes. Clothes, most definitely. 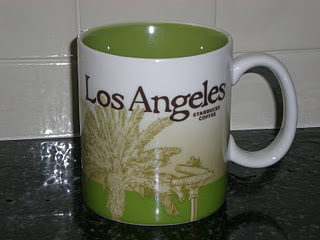 Starbucks city mugs, no. My mug gathering is not willy-nilly. It has a rhyme and a reason. Then there is the Paris mug. 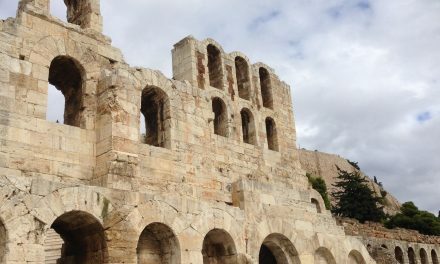 More sepia-colored than green with red accents, the scenes of my beloved city seduced me right away. How could I not get this mug? 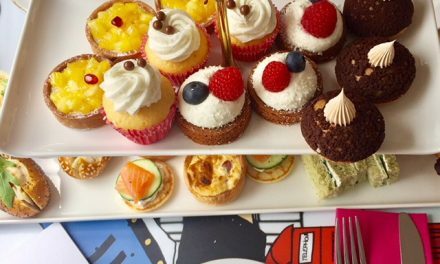 And can there really be a Paris without France? Same sepia tones, different scenery. But in my defense, I can’t be accused of collecting this particular mug because it was given to me as a thank you by the ladies who went on the Cordon Bleu tour I organized. 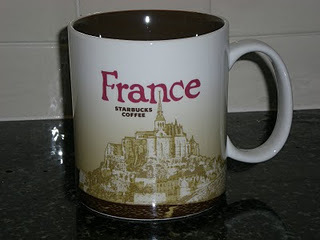 And while I probably wouldn’t have bought it myself, it compliments the Paris mug quite nicely, don’t ‘cha think? 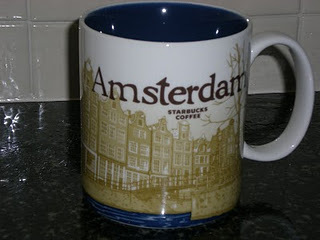 The latest acquisition is the Amsterdam city mug. 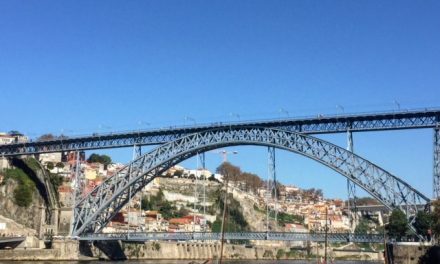 Canals, row houses with gabled roofs, and on the backside, an omafiets. Quintessential Amsterdam. I do live in Holland and since it took FOREVER for Starbucks to come to the Netherlands I kinda feel like I’ve earned that one. UPDATE: The Hague’s first Starbucks opened its doors in the train station this summer**, and I am all over it! There are no city mugs for The Hague specifically, but there is now a Netherlands mug, both in the stores and in my quote-unquote collection. 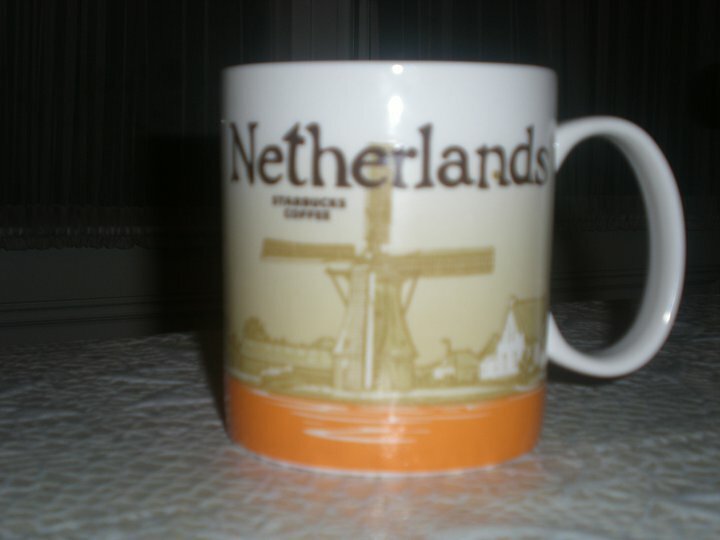 This mug has shades of orange, as the Dutch royal family hails from the House of Orange-Nassau, it has scenes of the typically Dutch windmill on the front and tulip on the back. Don’t judge me. If ever a Starbucks mug was earned, after living in The Netherlands for more than a dozen years, that one most certainly was.